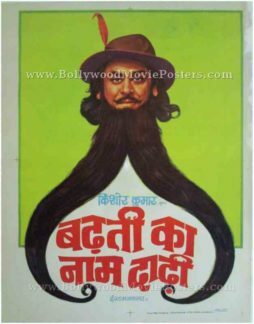 Vintage Indian poster for sale of the old Hindi film Badhti Ka Naam Dadhi (1974). This is an actual surviving old Indian movie poster for sale of the 1974 comedy drama that starred the most successful playback singer in Indian cinema, Kishore Kumar in the lead role. The film was directed by Kishore Kumar himself and he even composed its music. This vintage Indian movie poster has been professionally restored by an expert paper archivist. It has been backed on cotton using a thorough acid-free conservation and restoration process and comes with a preservation guarantee. Badhti Ka Naam Dadhi also starred Kishore Kumar’s elder brother Ashok Kumar. K.N. Singh, I.S. Johar, Rajesh Khanna, Asrani and Bindu played supporting roles in the film. The film revolved around a hilarious plot wherein a multimillionaire decides to leave his entire wealth to the person who has the longest beard. Kishore Kumar is considered as one of the most versatile personalities of Bollywood – he was a playback singer, an actor, a lyricist, a music composer, a producer, a director and a screenwriter, making this old Indian poster highly collectible! Printed and circulated during the original first release of the film (somewhere in the early 1970s), this old Kishore Kumar movie poster was printed for publicity of the film but never ended up being used. 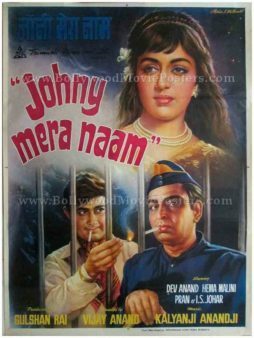 This old Kishore Kumar movie poster was originally designed in hand painted oil on canvas format by one of the best Bollywood poster painters of his time, V.G. Parchure. The printed signature of Bollywood poster artist V.G. Parchure is seen in the name of his art studio, i.e. “Pamart” on the bottom right of this Kishore Kumar movie poster. This stunning minimalist Bollywood poster captures actor Kishore Kumar in a hilarious avatar. Set against a green background, the title of the film appears in interesting typography in red at the bottom. Vintage Bollywood poster for sale of the Hindi film Albela (1971). 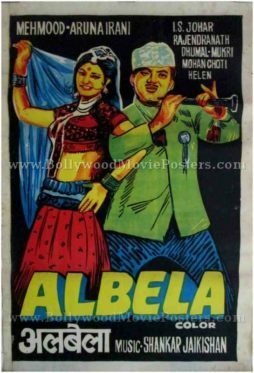 This is an actual surviving vintage Bollywood poster for sale of the 1971 Hindi comedy film Albela which starred one of the greatest comedians in Indian cinema, Mehmood in the lead role. The star cast of the film also included comedians like I.S. Johar, Mukri, Rajendra Nath and Mohan Choti. 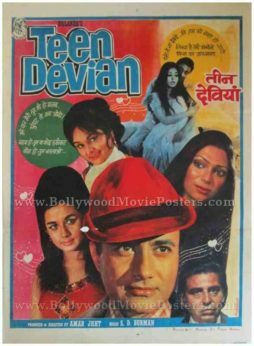 Printed and circulated a few years after the original first release of the film (somewhere in the mid 1970s), this vintage Bollywood movie poster for sale was printed for publicity of the film but never ended up being used. This vintage Bollywood poster for sale was originally designed in hand painted oil on canvas format by a small time art studio in Kolkata, making it highly collectible. Quirky hand drawn portraits of the lead couple Mehmood and Aruna Irani are seen in a dancing pose in this vintage Bollywood poster. The poster is set against a black background with the lettering at the bottom appearing in a stunning yellow blue font. 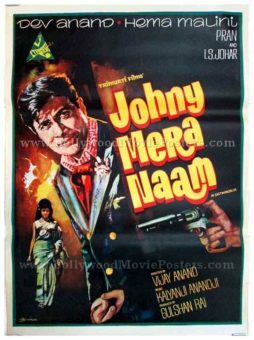 The music has for Albela was composed by the hit music director Shankar – Jaikishan, who are duly credited at the bottom of the poster. Vintage Bollywood poster for sale of the old Hindi film Shagird (1967). This is an actual surviving old hand painted Bollywood movie poster for sale of the 1967 Hindi comedy film that starred Joy Mukherjee and Saira Banu in lead roles. Printed and circulated a few years after the first release of the film (somewhere in the late 1960s / early 1970s), this old hand painted Bollywood poster for sale was designed for publicity of the film but never ended up being used. This old movie poster was originally hand designed in oil on canvas format by Bollywood poster painter S. Rehman. The quirky hand drawn techniques of old school Bollywood poster painters is starkly evident in this Bollywood poster painting. The printed signature of Bollywood poster painter S. Rehman is seen on the bottom of the poster – above the title. Quirky hand painted portraits of the lead actors are seen in various poses. The poster is set against a bright yellow background, with ample use of green and blue colors for highlights, giving it a very eye catching appearance. 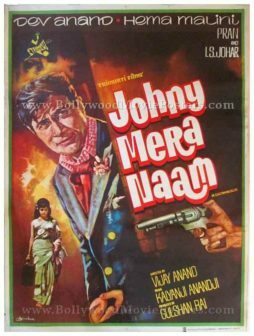 Typical of poster painter S. Rehman’s trademark style, an actor is seen holding a pistol at the bottom of this old hand painted Bollywood poster. Very rare vintage Bollywood poster of the old Hindi film Kitna Badal Gaya Insaan (1957) for sale. This is an actual surviving vintage Bollywood poster of the 1957 film directed by I.S. Johar that starred Ajit and Nalini Jaywant in lead roles. Printed and circulated somewhere during the first release of the film (Late 1950s), this old vintage Bollywood movie poster was originally designed for publicity of the film but never ended up being used. This Bollywood poster was originally designed on a hand painted canvas, making it highly collectable. 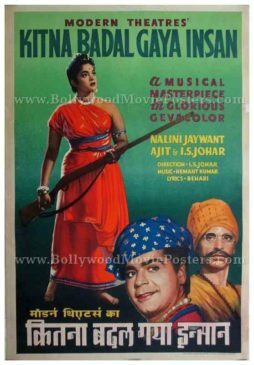 Lead actress Nalini Jaywant is seen holding a rifle prominently in the poster, while Ajit and I.S. Johar are seen in smaller portraits at the bottom. The poster announces the film as a “Musical Masterpiece in Glorious Gevacolor” typifying the production technology in the era it was released.